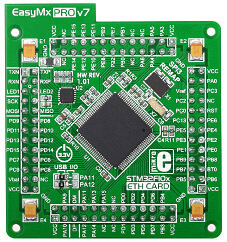 EasyMx PRO™ v7 for STM32 ARM® is a full-featured development board for STM32 ARM® Cortex™-M3, Cortex™-M4, Cortex™-M7, and Cortex™ M0 microntrollers. It contains many on-board modules necessary for development variety of applications, including multimedia, Ethernet, USB, CAN and other. On-board mikroProg™ programmer and debugger supports over 180 ARM® microcontrollers. Board is delivered with MCU card containing STM32F107VCT6. 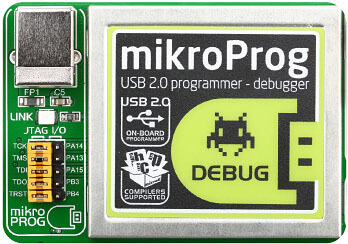 mikroProg™ is a fast USB 2.0 programmer with hardware debugger based on polular ST-LINK v2 debugger. It supports over 180 STM32 ARM® Cortex™-M3 and Cortex™-M4 microcontrollers from STMicroelectronics®. Outstanding performance and easy operation are among it’s top features. 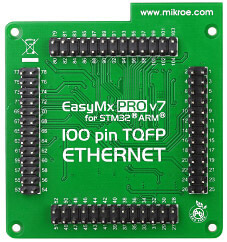 EasyMx PRO™ v7 for STM32 MCUcard is included in the package with the board. It's also sold separately, if you'd like a spare one to integrate into your own hardware or for any other reason.